Big data raise major research possibilities for political communication scholars who are interested in how citizens, elites, and journalists interact. With the availability of social media data, academics can observe, on a large scale, how people talk about politics. The opportunity to study political discussions is also available to media organizations and political elites—examining how they make use of big data represents another fruitful scholarly trajectory. The scholars involved in Digital Discussions represent forward thinkers who aim to inform the study of political communication by analyzing the behavior of and messages left by citizens, elites, and journalists in digital spaces. 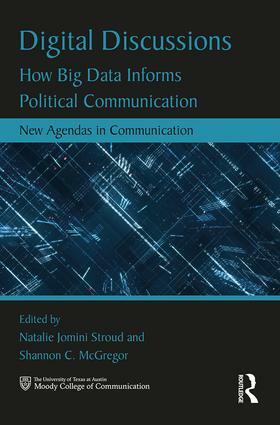 By using a variety of methodological approaches and bringing together diverse theoretical perspectives, this group sheds light on how big data can inform political communication research. It is critical reading for those studying and working in communication studies with a focus on big data. Natalie Jomini Stroud is an associate professor in the Department of Communication Studies and the School of Journalism, Director of the Center for Media Engagement, and Assistant Director of Research at the Annette Strauss Institute for Civic Life in the Moody College of Communication at the University of Texas at Austin. Her research focuses on selective exposure, media effects, and the role of journalism in a democracy. Shannon C. McGregor is an assistant professor in the Department of Communication at The University of Utah. Her research interests center on political communication, social media, public opinion, gender, news, and data. Her research has been published in the Journal of Communication, Political Communication, New Media & Society, Information, Communication & Society, Social Media + Society, and the Journal of Broadcasting & Electronic Media.